Shirts With Random Triangles: Nick Saban discusses taking down time during the offseason. Nick Saban discusses taking down time during the offseason. 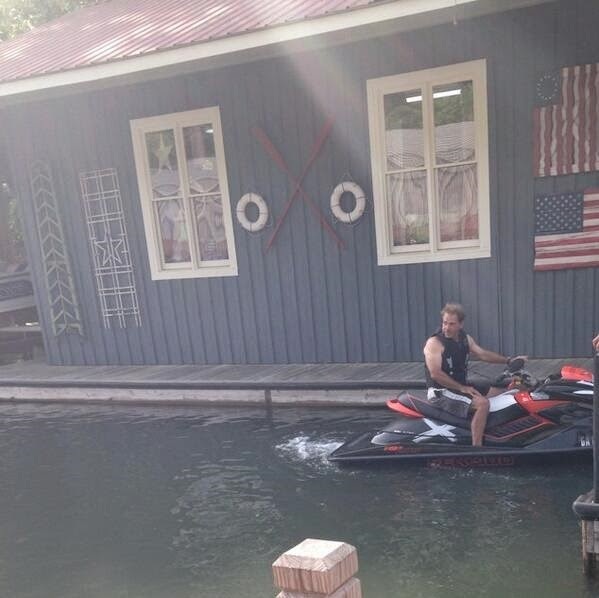 The sports blogosphere's collective heart went all a-flutter last week when a photo of Alabama head coach Nick Saban riding a jet ski at his Lake Burton, Ga. lake house appeared on Twitter.. You could have cut the thickness of the collective mancrush with a knife as pundits tripped over themselves describing Saban's bare arms and potentially bare chest covered by a life jacket. It's hard to imagine Saban doing anything close to recreational activities. The Alabama head coach apparently does take down time, however. He discussed the subject with reporters in Birmingham who were covering the annual charity golf tournament that benefits Saban's Nick's Kids Fund charity. "I really enjoy it because it's a lot of quiet time for me to really do work on the season without having lots of interruptions. We certainly look forward to going to the lake. It's a great family thing for us and something that all the coaches probably look forward to because our coaches work extremely hard throughout the course of the year, whether it's developing our payers, recruiting. This is a great family time before we gear it up for the season." Alabama's first game of the 2014 season will be the Chick-fil-A Kickoff Game against West Virginia in Atlanta on Aug. 30.